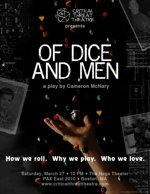 Of Dice and Men is a comedic play by Cameron McNary about a group of 30-something D&D players, and what happens when one of them enlists to go to Iraq. It's based loosely on Of Mice and Men (which you may have guessed), and it ran at PAX Prime and PAX East in 2011. Guess what? Now it's going to be a movie! Or at least it could become a movie, if Cavegirl Productions' Indiegogo campaign successfully funds. We certainly hope it does, and not just because they're going to be using GURPS products in the movie! Their campaign ends September 6.